(1954) "Flip, Flop and Fly"
"Flip, Flop and Fly" is a song recorded by Big Joe Turner in 1955. Called a "prototypical rocker", "Flip, Flop and Fly" has been recorded by a variety of artists, including early rock and roll performers such as Elvis Presley. 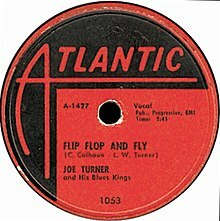 "Flip, Flop and Fly" has an arrangement similar to Big Joe Turner's 1954 number one R&B chart hit "Shake, Rattle and Roll". Music critic Cub Koda suggests that "leftover verses [from the 'Shake, Rattle and Roll' recording session] were then recycled into Turner's follow-up hit, 'Flip, Flop and Fly.'" Both are up-tempo twelve-bar blues with a strong backbeat. "Flip, Flop and Fly" reached number two on Billboard magazine's R&B chart in 1955, less than one year after "Shake, Rattle and Roll". Accompanying Turner on vocals are the song's writer Jesse Stone on piano, Al Sears on tenor sax, Connie Kay on drums, and unidentified trumpet, alto sax, baritone sax, guitar, and bass players. Turner subsequently recorded several live versions of the song. The song appeared on the 1957 album Rock & Roll (Atlantic: 8005). Elvis Presley performed "Flip, Flop and Fly" during his first television appearance on January 28, 1956. It was included with a medley of "Shake, Rattle and Roll" and "I Got a Woman" and released on his posthumous compilation album A Golden Celebration. A live version from 1974 was included on Elvis: As Recorded Live on Stage in Memphis. Several artists have recorded their versions of "Flip, Flop and Fly," including Johnnie Ray (1955), Bill Haley & His Comets on the album Rock Around the Clock (1956), Downchild Blues Band (1973), Paolo Noel [fr] in French (1974), the New York Dolls during live performances (1976), Doug Kershaw on his album also titled Flip, Flop & Fly (1977), the Blues Brothers on Briefcase Full of Blues (1978), Geraint Watkins Band on It's Rock 'N' Roll Vol. 2 (1978), Jerry Lee Lewis (1999), and Ellis Hall for the Chicken Run soundtrack (2000). ^ Gilliland, John (1969). "Show 3 - The Tribal Drum: The rise of rhythm and blues. [Part 1]" (audio). Pop Chronicles. University of North Texas Libraries. ^ Dahl, Bill (1996). "Big Joe Turner". In Erlewine, Michael (ed.). All Music Guide to the Blues. San Francisco: Miller Freeman Books. p. 254. ISBN 0-87930-424-3. ^ Billboard (February 26, 1955). "Review Spotlight on ... Flip, Flop and Fly". Billboard. 67 (9): 57. ISSN 0006-2510. ^ Koda, Cub. "Big Joe Turner: Shake, Rattle and Roll – Song Review". AllMusic. Retrieved June 19, 2011. ^ Whitburn, Joel (1988). Top R&B Singles 1942–1988. Menomonee Falls, Wisconsin: Record Research. p. 419. ISBN 0-89820-068-7. ^ "Joe Turner* - Rock & Roll". Discogs. Retrieved 15 May 2018. This page was last edited on 3 September 2018, at 15:05 (UTC).